The most famous examples of Cyclopean masonry are found in the walls of Mycenae and Tiryns, and the style is characteristic of Mycenaean fortifications. Similar styles of stonework are found in other cultures and the term has come to be used to describe typical stonework of this sort, such as the old city walls of Rajgir. The term comes from the belief of classical Greeks that only the mythical Cyclopes had the strength to move the enormous boulders that made up the walls of Mycenae and Tiryns. Pliny's Natural History reported the tradition attributed to Aristotle, that the Cyclopes were the inventors of masonry towers, giving rise to the designation Cyclopean. The walls are usually founded in extremely shallow beddings carved out of the bedrock. 'Cyclopean', the term normally applied to the masonry style characteristic of Mycenaean fortification systems, describes walls built of huge, unworked limestone boulders which are roughly fitted together. Between these boulders, smaller chunks of limestone fill the interstices. The exterior faces of the large boulders may be roughly hammer-dressed, but the boulders themselves are never carefully cut blocks. Very large boulders are typical of the Mycenaean walls at Mycenae, Tiryns, Argos, Krisa (in Phocis), and the Athenian Acropolis. Somewhat smaller boulders occur in the walls of Midea, whereas large limestone slabs are characteristic of the walls at Gla. Cut stone masonry is used only in and around gateways, conglomerate at Mycenae and Tiryns and perhaps both conglomerate and limestone at Argos. The first style, which is the oldest, consists of unwrought stones of various sizes in which the gaps are, or were, filled with small stones. The second is characterized by polygonal stones, which fit against each other with precision. The third style includes structures in Phocis, Boeotia and Argolis. It is characterized by work made in courses and by stones of unequal size, but of the same height. This category includes the walls of Mycenae, the Lion Gate, and the Treasury of Atreus. The fourth style is characterized by horizontal courses of masonry, not always of the same height, but of stones which are all rectangular. This style is common in Attica. While Peck's first and possibly second and third styles conform to what archaeologists today would classify as cyclopean, the fourth now is referred to as ashlar and is not considered cyclopean. There is a more detailed description of the Cyclopean styles at the Perseus Project. Modern archaeologists use "Cyclopean" in a more restricted sense than the description by Pausanias; while Pausanias attributes all of the fortifications of Tiryns and Mycenae, including the Lion Gate, to the Cyclopes, only parts of these walls are built in Cyclopean masonry. The photograph above shows the difference between Cyclopean masonry (shown in the blue rectangle), and the ashlar masonry of the Lion Gate. 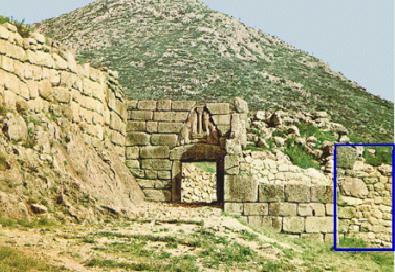 The entrance of a Mycenaean citadel in the Bronze Age, Lion Gate. It demonstrated the monumentalization occurring in Greece and showed the power of the citadel. Apart from the Tirynthian and Mycenaean walls, other Cyclopean structures include some tholos tombs in Greece and the fortifications of a number of Mycenaean sites, most famously at Gla. In Sicily there are many Cyclopean structures especially in the eastern part of the island. In Cyprus, the Kition archaeological site in present-day Larnaca, has revealed cyclopean walls. In the ancient city of Rajgriha (now Rajgir),Bihar,India cyclopean walls can be seen. The Nuraghe of Bronze Age Sardinia also are described as being constructed in cyclopean masonry, as are some of the constructions of the Talaiotic Culture abounding on Menorca and present to a lesser extent on Mallorca. One of the largest and least known is the "acropolis" in Alatri, an hour south of Rome. It also seems to have a portal the summer solstice sun shines and some think it is also has a number of other astronomical significant points to it. It is thought to be the second largest in Europe after Athens. ^ "The Cyclopean Wall Rajgir". Travel News India. 2017-03-07. Retrieved 2017-03-08. ^ Pliny, Hist. Nat.vii.56.195 : turres, ut Aristoteles, Cyclopes [invenerunt]. ^ Harry Thurston Peck, Harpers Dictionary of Classical Antiquities, 1898. ^ Neer, Richard (2012). Greek Art and Archaeology. Thames and Hudson. ISBN 9780500288771. Wikimedia Commons has media related to Cyclopean masonry.